Hamburg Airport has launched the next generation of airport. With the new, fully automated baggage drop, passengers will benefit from even more independence and flexibility at departure. The aim is to bring passengers to the plane without time-consuming processes. Since the start of November 2017, ten “self bag drop” kiosks have been in operation in Terminal 1. They were officially launched today. Four stations have also been installed for automated check-in. The kiosks, developed and manufactured by Materna GmbH in Dortmund, are technically equipped to provide services for all airlines. The “self bag drop” procedure is currently being used by Air France, KLM and easyJet. Other airlines will be added over time. 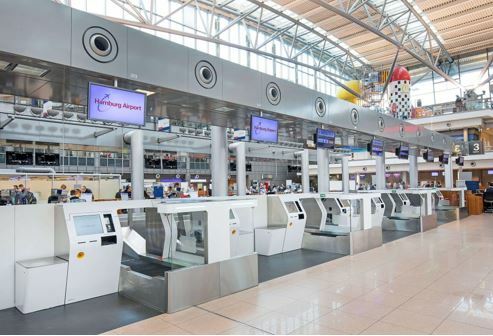 New kiosks for fully automated baggage drop at Hamburg Airport. 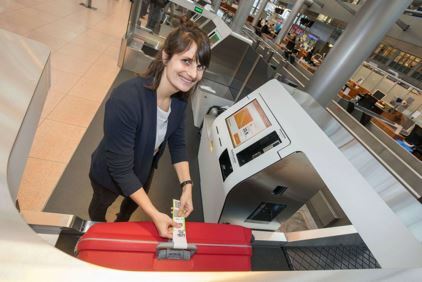 Hamburg Airport has taken a pioneering role in the deployment of self-service systems in Germany. The first “self bag drop” kiosks were introduced here three years ago. The new solution, however, adds features such as baggage classification. “The kiosks immediately detect items that shouldn’t be conveyed using the automated baggage transportation system,” explains Reinhard Augustin, Sales Director at Materna. “The passenger is then informed via the display that the item is to be checked as oversized baggage. This applies, for example, to folded strollers and prams, as well as to trekking backpacks with dangling shoulder straps that could block the conveyor system.” Checked items are automatically photographed. “In the event of damage or loss, for example, this makes it easier for the passenger to prove that the baggage was in good condition when it was checked in,” continues Reinhard Augustin. A further advantage for passengers is the larger number of kiosks available. In the past, for example, an easyJet passenger could only drop baggage at one kiosk, but now the whole ten are available. The “self bag drop” system is based on the international CUSS standard (Common Use Self-Service). This allows airlines to deploy their own applications on self bag drop equipment around the world without having to redevelop or adapt each time. 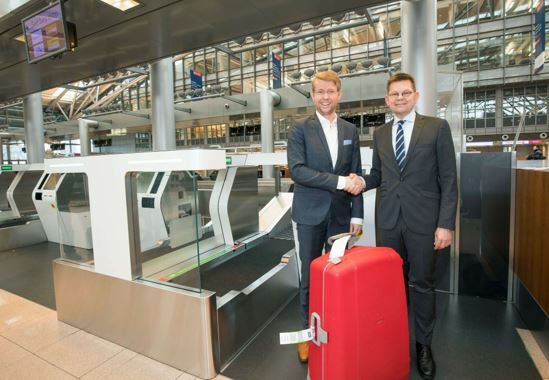 With the new, fully automated baggage drop, passengers will benefit from even more independence and flexibility at departure at Hamburg Airport. The user guide for “self bag drop” is simple: First, the user selects the airline on the screen and then scans the boarding pass. The next step is to answer security questions about the contents of the baggage. The baggage is then placed in the marked area on the conveyor, where it is automatically measured and weighed. The kiosk then prints the baggage tag with the barcode to be affixed to the baggage. This just needs to be confirmed on the screen, and the baggage receipt is issued. Baggage cannot be transported onward on the conveyor belt until it is correctly labelled. A scanner identifies errors or misuse of the kiosk immediately. The glass doors only open when an item of baggage has been identified as safe. The equipment can thus be used by different airlines. Johannes Scharnberg, Director of Aviation at Hamburg Airport, and Helmut Binder, CEO Materna, at today’s PR event (f.l.t.r.). As a leading IT service provider, Materna employs more than 1,900 people worldwide and generated turnover of 223 million euros in 2016. Materna’s portfolio covers the entire full-service premium segment, from consulting to implementation to operation. The target market consists of IT organisations, corporate departments and public administration. Materna is divided into six business lines: IT Factory, Digital Enterprise, Government, Communications, Mobility and the SAP consulting company, cbs in Heidelberg. Under the Materna ips brand (Integrated Passenger Services), and as one of the world’s leading suppliers for airports and airlines, Materna offers solutions for automated passenger handling at airports. With around 17.6 million passengers per year, Hamburg Airport is the fifth-largest airport in Germany. Passengers can choose from a well spread route network, with 130 domestic and international destinations served by around 60 airlines. Incorporating Hamburg, Schleswig-Holstein and parts of Lower Saxony, Mecklenburg-Western Pomerania and Denmark, Hamburg Airport’s large catchment area, with its substantial passenger potential, is extremely interesting for all airlines. Hamburg Airport is equipping itself to face the challenges of the future of aviation with a modern infrastructure. Almost 250 businesses based at the airport employ approximately 15,000 staff (incl. approx. 2,000 directly employed by the airport). The partially privatised airport is owned by the Free & Hanseatic City of Hamburg, with a 51 percent holding, and AviAlliance GmbH with a 49 percent stake.